Lwandle Ngwenya is 21 years old and is from Glenwood, Durban. 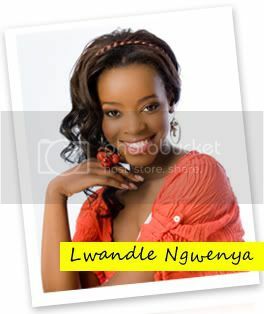 She won Miss Durban in 2009 and currently holds the title for Miss Spring 2010. She speaks English, Siswati and isiZulu and is confident and relaxed in front of the camera. For her, being a Miss South Africa Finalist has been a dream for as long as she can remember and Lwandle believes she has the passion and spirit to win the Miss South Africa crown in 2011. Standing at 1.77 metres tall, mostly made up of slim legs, Lwandle has a heart-shape face which suits her open, lovely personality.